When Anna Dolhansky joined Universal Soccer Academy as a teenager, it was clear from the start that she was special. Her passion for the game in place, she came to Universal at the age of 15 seeking to improve her skills and fitness, just like hundreds of other young soccer players. But James Galanis, Universal’s Director of Operations, saw qualities that set her apart from other players her age - courage, creativity, confidence and commitment. These characteristics translated into her “playing big in big games . . . a unique quality,” says Coach Galanis. Anna graduated from college with a degree in nursing. 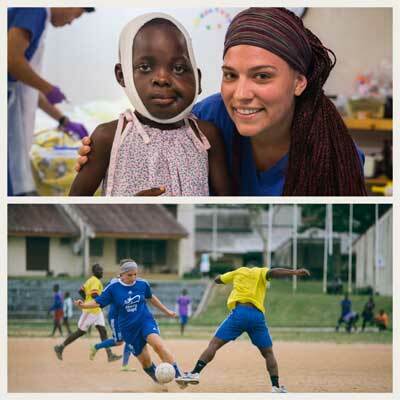 She did not pursue her earlier dream of playing professional soccer. Instead, she took a position at the Children’s Hospital of Philadelphia. Though happy with her choice of profession, Anna still felt the desire to travel. And so, she became a traveling nurse, moving to different locations throughout the United States to alleviate hospital nursing shortages. Anna’s calling to help the sick and her passion for travel intensified when she learned about Mercy Ships, a non-profit organization that sends “floating hospitals” to poverty-stricken areas of the world lacking sufficient medical facilities and services. The medical professionals aboard the Mercy Ships’ fleet provides medical care and procedures - including life-saving surgeries - free of charge, to many of the people who would otherwise go without the proper medical attention. Anna and her shipmates performed maxillofacial surgeries to remove craniofacial tumors and repair cleft lips and palates. The team treated ear-nose-throat diseases. They provided plastic reconstructive options for benign tumors, chronic ulcers, severe wound scars and burn contractures, which are common when the use of machetes and open cooking fires are part of daily life. With 80% of the world’s fractures and the majority of club feet occurring in developing nations such as Cameroon, Anna helped with countless surgical treatments of these orthopedic issues. The Africa Mercy staff also taught the local healthcare providers about a universal non-surgical technique, the Ponseti method, for correcting club feet. Free services aboard the ship also included eye care, dental clinics, women’s services, and care for the mentally ill. For those patients whose condition progressed beyond the point where medical help could bring healing, the staff provided emotional support to the patients and their families, trained their caregivers in meeting the physical needs as their illnesses progressed, and assisted the grieving families to adjust emotionally and to develop new income opportunities to support themselves. Though the professional soccer career did not happen, Anna is confident she is on the path she was meant to follow. “I was really fortunate to have the opportunities in soccer that I had. I had dreams of traveling and playing soccer. But God had another plan for me.” But it seems that plan DID include travel and soccer. In her free time from her duties on Africa Mercy, Anna could often be found participating in a lively game of soccer with the local residents of Cameroon. In the dusty parking lot adjacent to the marina, far away from the fields of New Jersey, Anna realized just how fulfilling playing soccer overseas could be. Watch a video about this extraordinary young lady.